Alastair Reynolds has the kind of scientific imagination that few can match, his stories often explored on a grand scale. While the Universe in Revenger is certainly grand and gloriously imagined, the story itself it much more personal. The far future Galaxy of Revenger has seen vast Empires rise and fall while planets have been shattered and remade. In the rubble of our reformed solar system, many small planetoids orbit the now faint star. While many of these worlds have been populated by humanity and other races, some remain hidden. Small groups of humanity search these elusive rocks for treasures of past civilisations, fighting ruthless pirates and concealed dangers along the way. It can be a lucrative business for the right Captain with the right crew. Adrana and Fura Ness sign on to seek their fortune with Captain Rackamore on the old ship Monetta’s Mourn, looking to save their family from Bankruptcy. Rackamore has enemies though, not least the infamous and feared Bosa Sennen; there might be more waiting for them in space than adventure and fortune. 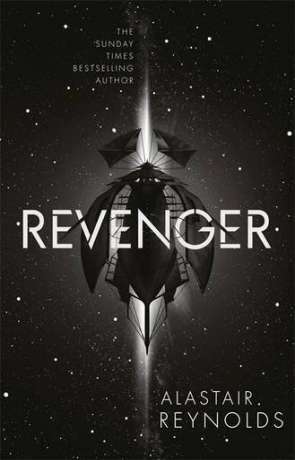 If you were to develop a formula for the ideal science fiction adventure, then Revenger would be the result. It's much more focused and character driven than any of the authors previous works. As you might expect from Reynolds the space around which this story plays out is a wonderfully imagined, detailed solar system complete with it's own sets of rules and language quirks. Humans are referred to as monkeys while there are aliens called crawlies due to their body-shape. Those who live aboard these space ships even develop a piratical slang, it's a wonderful idea than adds to the unique voice and style. To re-enforce this idea of Pirates these space faring vessels even have sails - a real technology known as solar sails which uses the radiation pressure of the sun as a means of green, low-cost and long-life propulsion. The targets of the Pirates are small rocks known as Baubles which are often booby-trapped and have some form of protective covering that only opens at certain times. They do often however contain treasures that are worth the risk, long forgotten technology that no-one knows how to make built by a civilisation that is just a memory passed on through generations. The two sisters Adrana and Fura Ness are interesting and like-able, although the focus is mostly given to Fura. The supporting cast of colourful characters works well and Reynolds manages to really bring these people to life. The writing sparkles and is ever so easy to read, while the pace is spot-on, there is little wasted space and no break in the story. The only criticism I could level was that I would have liked to have seen the ending stretched out a little more. The characters, engaging story and magical backdrop means I was glued to the book from beginning to end and read it over the course of two days (not an easy feat with two small children, a full-time job and house renovating). Revenger is the most entertaining, transfixing and memorable book I've read in some time. It has character, style and imagination not to mention a rich and detailed backdrop. I would pay good money to read more stories set within the universe of Revenger. One of the finest science fiction stories you could hope to read from one of the masters of 21st century science fiction. Written on 26th September 2016 by Ant.